DENVER, C.O., September 5, 2007 — Booth #765 — Samsung Electronics, the global market leader in HDTVs, will showcase the company’s latest products designed for the true HD and home entertainment aficionado at the 2007 CEDIA Expo in Denver, Colorado September 6 – 8. From the latest in LCD, Plasma and DLP rear-projection HDTVs, to full-featured home theater audio and video solutions, Samsung will display a variety of offerings ideal for the custom installer looking to build the ultimate HD experience for their clients. In particular, the HT-BD2, a home theater system with integrated Blu-ray disc playback, and the BD-UP5000, the Blu-ray and HD DVD duo-format high-definition player, will be showcased. 	81 Series LED LCD HDTV – The 81 Series 1080p LCD HDTV employs a light-emitting diode (LED) backlight unit, instead of the conventional cold cathode fluorescent lamp (CCFL), resulting in a dynamic contrast ratio that is amongst the highest ever seen on a flat panel at 500,000:1. LED smart lighting technology engenders a remarkable dynamic contrast ratio by dimming darker areas of the display for deeper black levels. The HDTV also features LED Motion Plus technology which helps reduce motion blur from fast-paced content. 	71 Series LCD HDTV – Featuring Auto-Motion Plus 120Hz technology, the 71 Series reduces motion-blur from fast-pace action content so every live sports game, video game and each scene in a movie comes through in clear HD quality. Including Full HD 1080p resolution, 25,000:1 dynamic contrast ratio, a wide color gamut CCFL backlight unit and Super clear panel technology, the 71 Series brings a new level of clarity to HDTV with truer, more lifelike black tones for superior picture quality. 	94 Series Wireless Plasma – Samsung’s 94 Series Wireless 1080p Plasma HDTV frees consumers from the clutter of messy wires and costly installations usually associated with mounting a plasma HDTV on the wall. Using advanced 802.11n wireless technology, the 94 Series HDTV not only allows consumers to enjoy the latest in HD television and movies, but also makes it easy for consumers to streamline the look and feel of their home theaters. Samsung has adopted a new Auto Wall Mount system for select 2007 Flat Panel (40- through 52-inch) HDTVs. The system allows users to adjust the angle of the display using the TV’s remote control. The TV can be tilted from 15- to 20-degrees in multiple directions, and a safety sensor prevents it from touching the wall or anything that may interfere with the display while in motion. Samsung’s Auto Wall Mount system is now available at an estimated selling price of $799. 	2007 DLP HDTV with 3-D Ready Technology – Samsung’s 2007 DLP HDTVs are transformed into interactive entertainment portals when used with special 3-D software and LCD shutter glasses (sold separately), bringing realistic gaming and movie-viewing into the home. While gamers will receive an immersive gaming experience with enhanced 3-D graphics, movie fans will revel in the life-like quality of movie characters and landscapes. 	BD-UP5000 Duo HD Player — Samsung’s BD-UP5000 Duo HD Player supports both Blu-ray and HD DVD formats as well as their interactive technologies, HDi and BD-Java. With the use of HQV video processing power and 1080p Full HD video output, the truest image reproduction possible can be enjoyed. 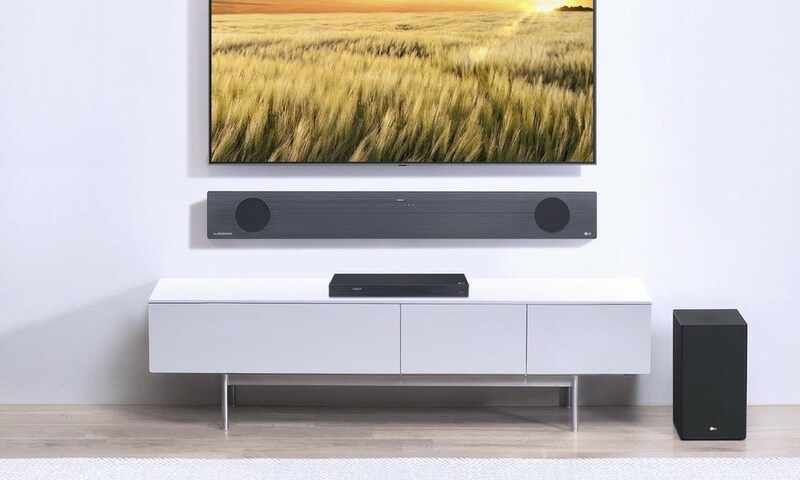 	HT-BD2 Home Theater Solution with Blu-ray: Consumers can now experience an immersive movie-viewing experience with a home theater solution that combines the full HD 1080p cinematic video quality of a Blu-ray player and a powerful 1,100 watt, 7.1 channel sound system. With its slick, piano black design and soft blue LED accents, the HT-BD2, a home theater system with integrated Blu-ray disc playback, enhances both the audio presence and visual aesthetics of a home theater.